And that, my dear friends, makes me interminably pleased! I do so love them. I mean, think about it. They are journaling cards. And they are wood. And they are journaling cards. For reals, though. And the best part is that they can be so easily be used for both cards and scrapbooking! YAY! Teri, over at Moxie Fab World, has put forth a challenge to create a paper crafted project using a journaling card! This challenge is inspired by the fabulous Photo Pocket Scrapbooking issue from Paper Crafts and Scrapbooking Magazine, in which I have two projects. One is a card (that totally uses a calender journaling card, dude! ), and the other a tag that I kind of love with all of my heart. So, I wanted to create another card, but one that is totally different from the one I have in the magazine. That's when I reached for the wood! LOVE! Actually, this card uses three journaling cards. And you can't even tell! WHAT? Yup. Totes, dude. I used one large 4x6 card from the My Mind's Eye Just Splendid journaling card kit for the background paper! LOVE IT! I then backed the wood card (also from the kit) with a small card with the same pattern. 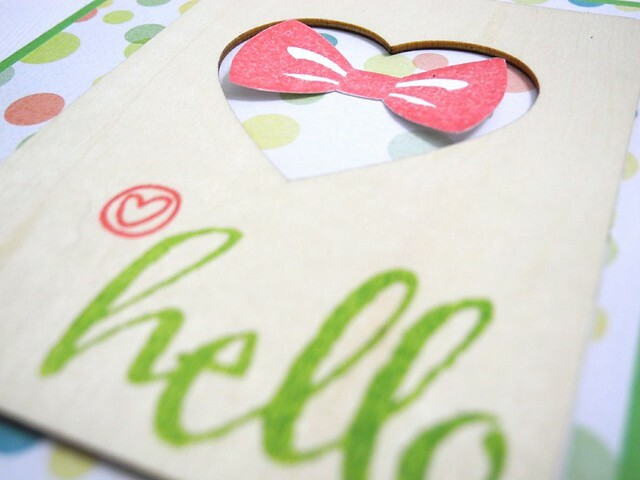 I stamped directly on the wood using pigment inks and then stamped and trimmed the bow to add it inside the heart. This was SUCH a fun card to create! And there you have my fun little card! I am linking up all of the supplies I used below, so be sure to check them out! This one uses a couple of fun stamp sets. Also... my tip for the day... ALWAYS use pigment ink when stamping on wood. It keeps it from bleeding out into the wood. WHY, you ask? Well, dye ink is formulated to seep into a porous surface such as cardstock. This gives you an awesome, even stamped image when working on cardstock. However, when you have a wider grain porous surface, such as wood or fabric, the dye ink will feather out and won't look crisp. Pigment ink, however, is formulated to sit on top of the porous surface. It needs a bit of tooth to dry properly, hence the porous surface, rather than a slick one, however, it doesn't imbed itself into the fibers as much and thusly, does not feather out or bleed. Welcome to the science behind crafts with Jingle. HA! That's all for today, folks! On the 'morrow! Ooooh, this is awesome! Love the wood journaling card and the colors...So happy! so pigment ink and a stamp did this? Ohhhh, I'm going to try this out! CONGRATULATIONS on having two cards featured!!! FABULOUS card today, LOVE the delicious dots and heart window :) THANK YOU for sharing your top inking tip too - such crisp stamping - I really didn't know => now I am better prepared for when I work with wood!!! That's so cool... I'll look for your cards! I wondered what you do with those wood cards ( of course we all know crafters can doing anything... I just hadn't seen anything done with them). Thanks for the inspiration ! Yummy polka dots and I LOVE the wood veneer journaling card! So super cute! Awesome tip for wood too--I have TONS of it and probably would have stamped without thinking thus finding out the hard way--usually how do things lol. How nice to have this little pearl of crafty wisdom in my pocket now! ;) hugs and have a GREAT Tuesday!!! thanks for the science, all my stamping on wood pieces has bled, and now I know why! How did I miss this product??!! I didn't know you could get wooden journal cards, how cool is that!! And I certainly didn't think you could stamp on them. Thank you Teacher Jennifer for the scientific musings, I had no idea thats how the inks work and totally makes sense! 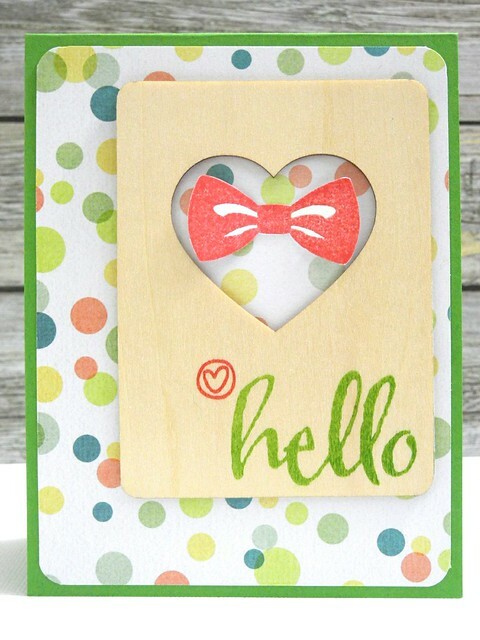 Back to the card, love it, the wood is gorgeous and you can never have enough polka dots....fabulish! This looks fab stamped onto the wood journalling card - this is new to me too but is a great idea for adding some touchy-feely factor. Awesome card! Thanks for the tip about stamping on wood!